The weather, the weather! Oooh the struggle for constant nice weather in New York. So the first day it got warm, best believe I rocked the only pair of shorts I had packed with me and this open knit sweater Spiegel sent over. 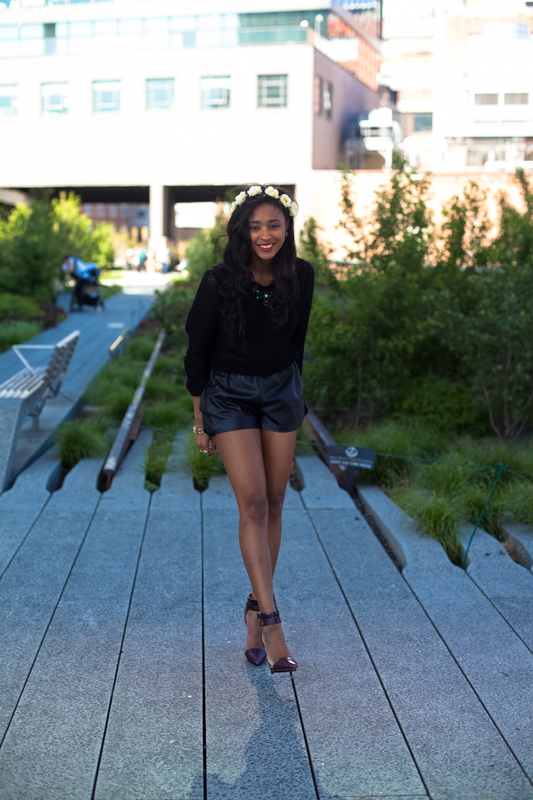 With such a beautiful day presented to us, we went to The High Line to shoot these shots. After this day it of course got cold again, but lately it’s been even nicer and more often too. How do you guys like my new Jagger Edge phone case? 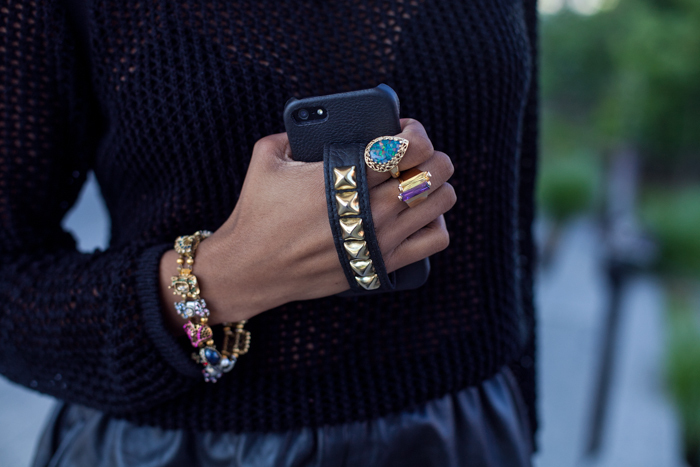 So cool right, I get so many compliments on it and it’s so handy for keeping a strong hold of my phone. I first wrote about JE on my blog back in 2011 when I was looking for an iPad case. Crazy! My first time wearing these ankle breakers went really well. Such a great heel that makes my legs look absolutely killer. I can definitely get away with wearing these out and about in Florida but no way in New York. Definitely need to invest in more flats for New York. I like this, I love those shoes as always! and this weather is working my very last nerves. I couldn’t believe how chilly it was while I was cooking out yesterday. Yeah, the clutch is really cute. Hope you’re enjoying your time in NYC. HOORAY for gifts from the bf’s mama and WHEN ARE YOU COMING HOME? Sheesh. Loving this outfit!!! And that case is about to get purchased lol. Stay fab love! It’s so good. I’m a chronic case changer and I can’t seem to give this one up. I didn’t wear them for very long. Mostly just for the photos because I was walking around New York City in the meatpacking district and the streets are not friendly for heels. what an absolutely stunning look girl, love those shoes! Woah, those heels. Cute and sassy outfit. Thanks for posting the photos and feel free to drop by me too soon. you look great in that outfit dear!!! 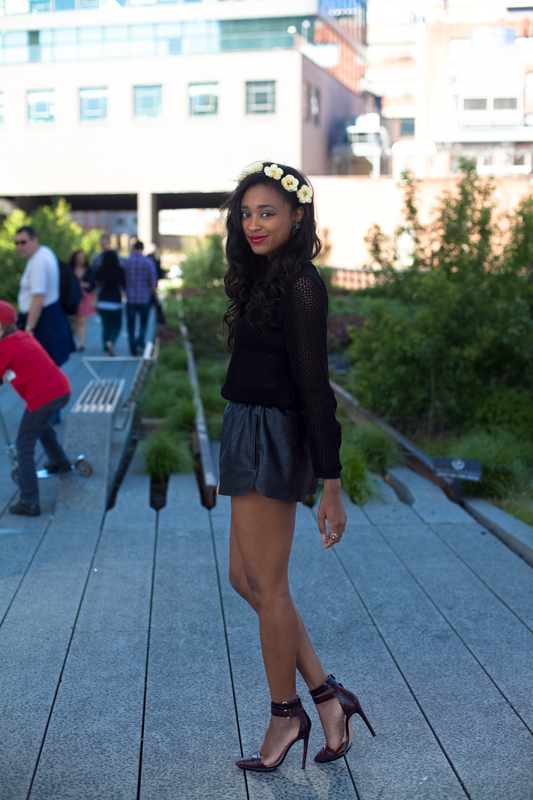 i love your crown of flower and your shoes!!! That nice weather struggle was everywhere, girl. Shoutout to those shorts though. They look fantastic on you. And those shoes? Well, they’re almost as fabulous as you.